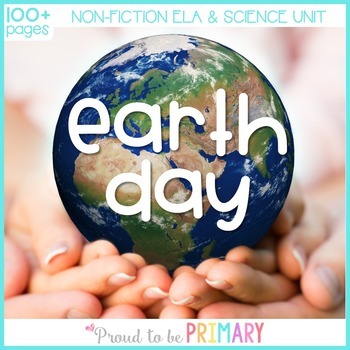 This Earth Day unit has 100+ pages full of everything you need to teach a comprehensive, hands-on, informative Earth Day and environment unit. You students will gain an understanding of the importance of caring for the earth, ways that they can help, and about recycling, reusing, reducing, pollution, and more. This unit contains lesson suggestions, printables, hands-on activities, a science experiment, anchor charts, fact posters, mini-books, sorts, & much more. View a complete list below and click the PREVIEW to see an overview of what you will receive. The activities align to the Common Core standards for Reading Informational Texts and Writing and the Next Generation Science Standards. You can NOW grab this unit in the Non-Fiction & Science for the Whole Year Bundle! This bundle has many units covering themes for the whole year! Grab it NOW HERE! *ASKING QUESTIONS before, during, and after reading and learning about Earth Day. Blank template provided for students to record their questions. *THEME WORD CARDS activity where students must define words about Earth Day using a glossary and illustrate the meaning. Words can be posted in a pocket chart for easy reference. *VOCABULARY WORD MATCHING activity where students must match Earth Day vocabulary words with their meaning. You could use these cards to play memory or glue the matches on the provided template. 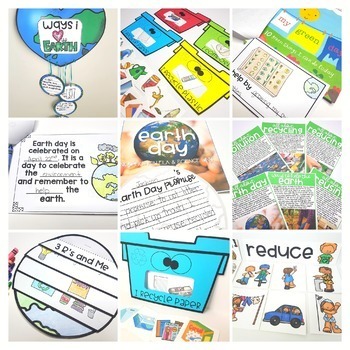 *6 full colorFACT POSTERS provide the teacher and students with information about Earth Day (all about Earth Day, pollution, recycling, reusing, reducing, ways to help the earth). For every poster, there is a question sheet. *Earth Day MINI_BOOK is a fill-in the blank mini-book with the important facts about Earth Day. *Earth DIRECTED DRAWING. Draw a cartoon earth and write a story about it using a variety of differentiated templates. *Recycling CRAFTIVITY. Sort picture cards into the correct recycling bin's mouth (paper, plastic, glass & metal, compost). *3 R's - Recycling, Reusing, Reducing SORT & FLIP BOOK. Create a flip book in the shape of the earth with a page for each of the 3 R's. Sort picture cards under the correct 3R heading. *Earth Day MOBILE. 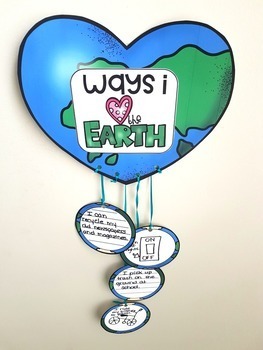 Create an earth mobile with ways to love and care for the earth. Lined and blank options, as well as color and black & white options are available. *Earth Day WRITING . Tons of writing prompts, a mini-book '5/10 Things I Can Do for the Earth', and Writing Mats. 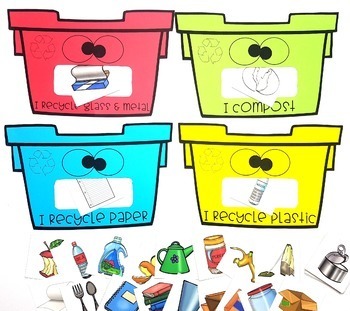 These are great for a writing center or after an Earth Day lesson. *Earth Day EXPERIMENT. Complete the Earth Day pollution experiment to test whether pollution can be removed from water. *SUPPLEMENTAL PAGES. Canadian pages are provided for Canadian buyers needing Canadian spelling. An Earth Day book list and additional art ideas are included.